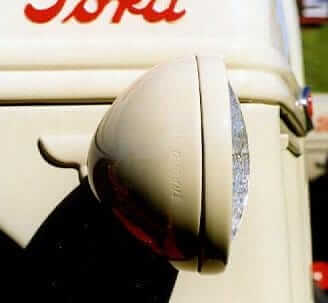 Original headlights. 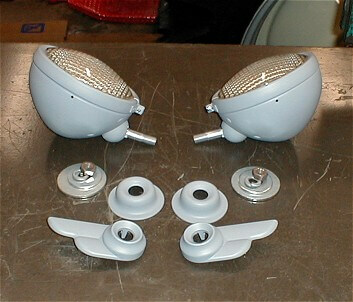 The photo on the left shows the two types of headlight mounts used on the 8N. The “wing” style mounts were used up until mid 1950 when they were replaced in the kits with the stamped steel round mounts that were probably cheaper but yet stronger than the easily broken aluminum wing type. The Tract-O-Lite name is visible on the headlight housing. 2N headlights were identical but did not have the Tract-O-Lite name.